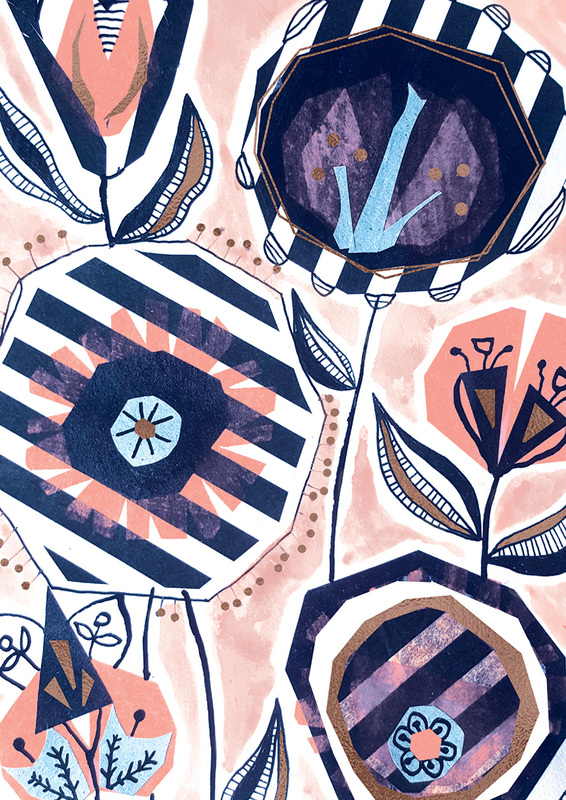 My name is Erin Dollar, and I’m a textile designer and surface pattern designer in San Diego, California. I launched Cotton & Flax, my collection of patterned textile home goods in 2012, and I opened my first retail shop last year! Have you always wanted to be a designer/illustrator? Not exactly! Like all kids, I was very creative when I was young, but I was part of the generation that watched Free Willy and immediately decided to be a marine biologist when I grew up. My creative side was at a soft simmer during my teenage years, and I took a lot of art and craft classes, including painting, ceramics, and photography. I had planned to major in Environmental Studies in college, but when I discovered the printmaking department, it was all over for me… I never wanted to leave. Discovering my creative passion as a newly minted adult sealed my fate, in a way. How did you come to the current point you are at in your career? When I first started working as an artist, I was working part-time jobs, and spending every spare minute in the studio. I would contribute art to gallery shows, and sell my work on Etsy -- at that point it looked more like a side hustle. I brought my artwork to some craft fairs, and the enthusiasm from shoppers encouraged me to put more work into my creative business, and consider the possibility that it could become my full time job. Cotton & Flax began as a series of experiments with printing my artworks on fabric, which I built into a full collection. Making utilitarian goods really appealed to me, and by honing my sense of pattern design, it helped me create a distinct style for my work. As the business grew, I’ve partnered with brands on pattern licensing projects. As I continue to grow as an artist, these partnerships and collaborations allow me to experiment, and grow in new directions! All my patterns begin as ink drawings. I use sumi ink to draw/paint a pattern onto smooth paper, and then scan and edit in photoshop. I am certain that there are easier ways to design simple patterns, but I find that working on an iPad or computer to start makes my patterns feel too “perfect.” It takes away some of the charm of the hand drawn line. My design process is usually centered around creating a pattern for a specific product, so I’m brainstorming color choices, and thinking about how the texture of the fabric will affect the design. For client projects, I’m often working from a design brief, so I am thinking about the best way to communicate the idea of the design through my minimalist modern lens. I have a design studio in San Diego that’s part retail shop, which is where I work from most days. I arrive in the morning, check emails, package and ship out orders from my online shop, and then the afternoon is spent working on admin or design projects. On a good day, I get to grab coffee down the street with a friend or client, and brainstorm new creative projects. I try to rest, and not beat myself up too much. Experimenting with a new technique or medium tends to help shake things up a bit. What has been/have been some of your favourite design projects to date? I’m very proud of the design work I’ve done for Cotton & Flax. Being in charge of the entire process, start to finish, is a huge undertaking, and I often forget to celebrate that fact! I’ve created two fabric collections for Robert Kaufman Fabrics, Arroyo and Balboa. Both are overprinted on linen fabrics, much in the same way that I create work for Cotton & Flax, which has made this a dream partnership for me. I created a collection of stationery for Scout Books, a company in my hometown of Portland, Oregon, that focuses on creating the coolest notebooks from recycled materials. One of my favorite commissions from 2018 was a pair of silk scarves that I designed for Deseda. This was one of my first fashion collaborations, and it was so exciting when the samples arrived in my mailbox! If you could go back 10 years and give your younger self one key piece of advice or an insight, what would it be? Try to slow down and enjoy your successes more. Find as many like-minded creative folks to collaborate with as possible, and be generous with your time. Sleep more, and wear sunscreen. Oooh, that’s a tough one! My first two are staples of all my design projects these days: sumi ink, and smooth bristol paper. Almost every pattern in my collection has started with those two tools. I guess my practical side would pick my computer as the third tool… but that’s boring! Instead, I’ll say my Case for Making watercolors, which feel so special and rare to me that I treat them like gold. Walking! I believe that so much of being an artist and a designer is just noticing things, little details that others might miss. When I go on a walk, my brain stops whirring over all the items on my to-do list, and let’s me just daydream and observe. Which designers, artists or individuals truly inspire you (past or present, living or dead)? 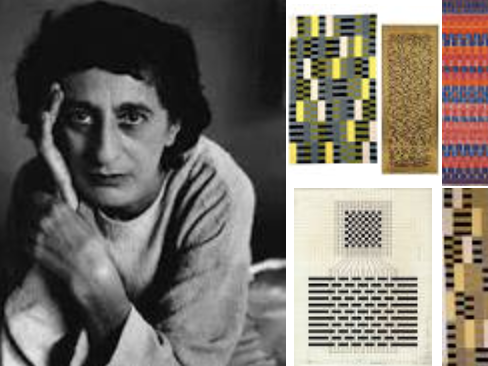 SO many: Anni Albers, Eva LeWitt, Yayoi Kusama, the quilters of Gees Bend, and Sigrid Calon come to mind. My friends inspire me constantly, Jen Hewett’s beautiful floral patterns always delight me, and Laure Joliet’s photos capture so much magic. I’m lucky to be surrounded by a truly creative community. You can learn more about me on my website, or you can get a peek at what I’m up to this week over on Instagram! Hi! I am Anne-Chris Hedlund from Sweden. Fossan Design is my company where I work as a pattern/textile designer. I recently moved to a house outside Stockholm with my partner, our daughter, our dog and two cats. Any day now we are expecting another little child, so my biggest focus in life right now, besides work, are of course my family. 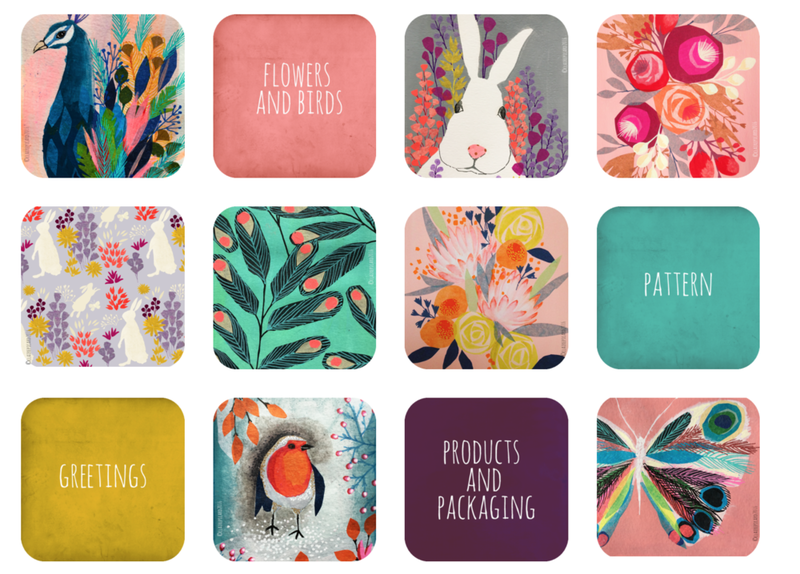 HAVE YOU ALWAYS WANTED TO BE A SURFACE PATTERN DESIGNER/ILLUSTRATOR? I have always been creative, but I come from a family of engineers so I thought that would be my path for a long time. While growing up, I began to realize that the happiest parts of my life was when I let myself create something, no matter if it was painting, writing, photographing, knitting or designing birthday cards. So for me it has been a process – finding out that illustration, and patterns in particular, was what I wanted to work with. Patterns makes me happy, it is my biggest passion! Currently I am dividing my time, working both as a project manager at an advertising agency and as a illustrator/textile designer at my own business Fossan Design. Although it can be hard to find the time for everything, I like the diversity. 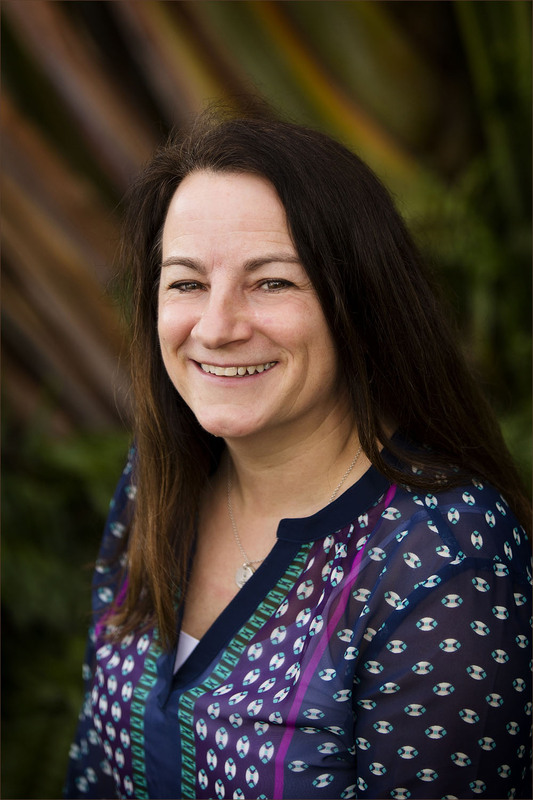 I get to go into town, meet people and work in teams as well as being at home in my studio illustrating and growing my business in whichever direction I choose. My main focus with Fossan Design right now is selling fabrics with my own designs. Fabric is a great surface to showcase design and I love to see pictures of customers wearing my patterns. A typical week includes cutting/packing fabric orders, talking to customers and suppliers, updating my webshop and social media, sewing inspirational clothes, seeking inspiration and of course illustrating new patterns. I also need to keep myself updated on what is on the market today and what is requested by the customers. Searching for inspiration! I go back to my favourite illustrators or search for new ones, analysing why I love to look at their work. What is catching my eye with it? The colours? The motif? The style? I make moodboards with things I like. It does also help changing scenery – taking a long walk, sitting outside in the sun or talking to a person that inspires me. WHAT ARE YOUR FAVOURITE DESIGN TOOLS?HOW WOULD YOU DESCRIBED YOUR DESIGN PROCESS? 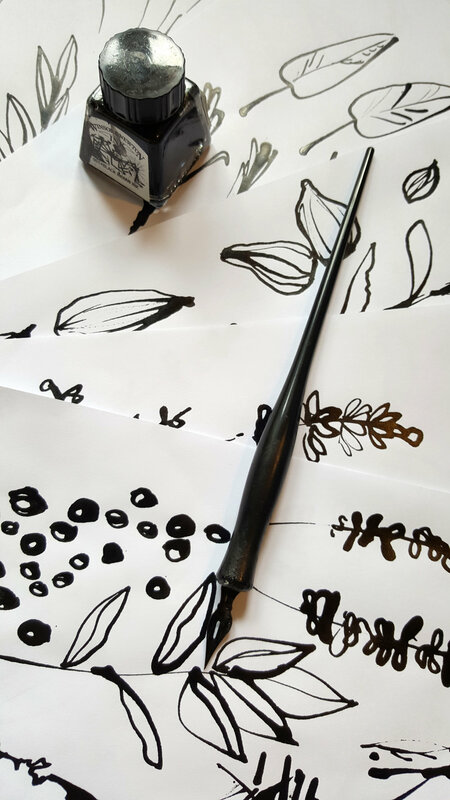 I have tested a lot of techniques over the years, but now I often work in the same way: I sketch up my motifs on paper, then draw outlines with an ink pen. Finally I scan the sketches and work with them in Illustrator. I like when the patterns are not “perfect” but has a playful, unique touch to them, and I like Illustrator since I always can go back and make variations in colours and composition. It is easy to edit and improve, and I guess I like that because I never feel quite finished with my work (it can always be better!). Instagram is by far my favourite app! I spend a little too much time scrolling that feed everyday..
That must be my latest collection of fabrics for spring/summer 2017. I got a great response and so many pre-orders that I felt confident printing a lot of fabrics, filling up my shelves with colourful textiles. I had worked hard on finding the right supplier for printing that met my demands on high quality, taking a social responsibility and having both organic and toxic free materials and printing process. When I found that, I also felt more confident in promoting myself and what I was offering. The pre-ordering process also helped me see which patterns people preferred and requested. I have so many ideas on what I would like to do! Mainly I want to grow this business I have now, but one dream would be to launch my own clothing line - perhaps in a collaboration with either a company or someone who shares my vision and can complement me. Everywhere. Wherever there is a pattern, or I can see a pattern, my eyes are drawn to it. It can be on wallpapers, carpets, peoples clothes on the subway, book covers or in the nature. 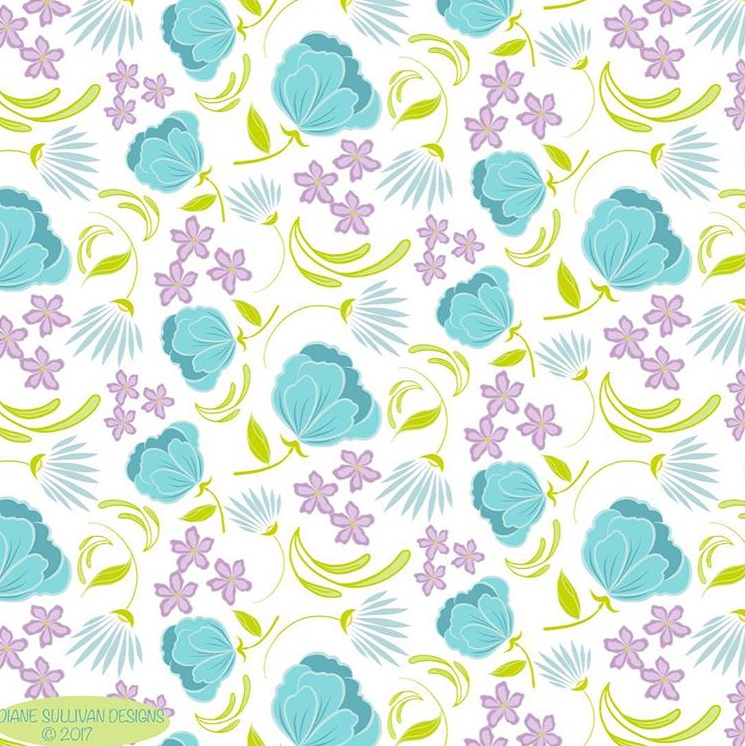 And online of course, on Pinterest, Instagram, Spoonflower.. I love the different online courses in illustration/design that gathers passionate people from all over the world. WHO WOULD YOU SAY THE GREATEST DESIGNER TO HAVE LIVED IS? 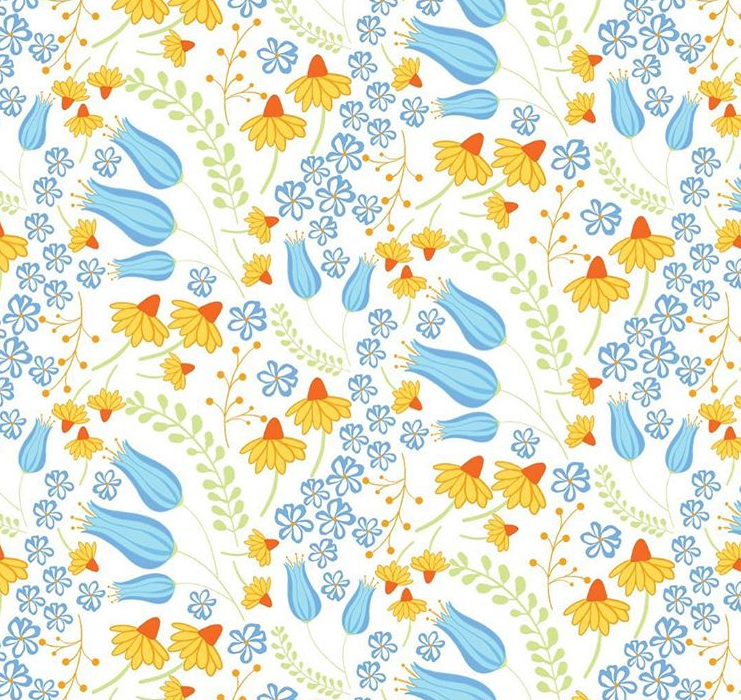 There are many but to name two: William Morris and Josef Frank. They have such beautiful details in their patterns, it is like they are telling a story. My favourite patterns is the ones that I can look at a long time and still discover new details in. I hope people remember me as an inspirational designer who made colourful, fun and detailed patterns! Hello! 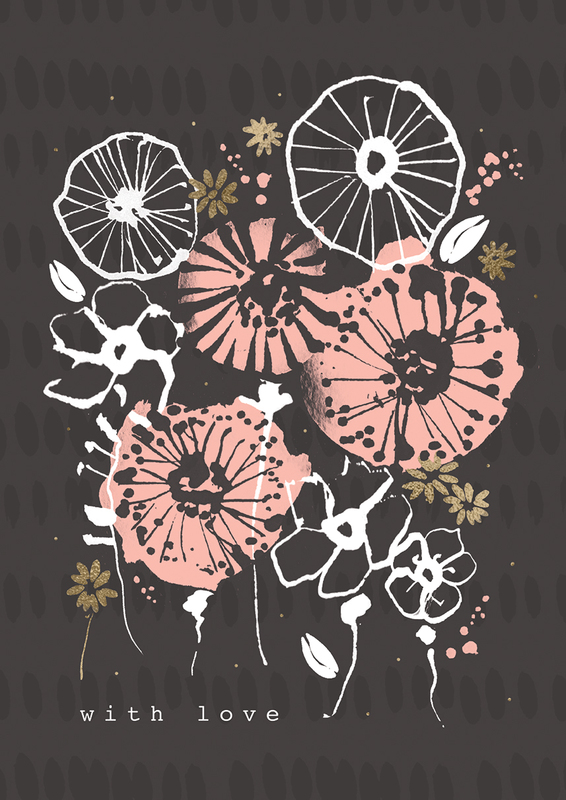 My name is Courtney Capone and I am a surface designer/illustrator living in Queens, NY. I work as a graphic designer by day, and spend my nights drawing, creating patterns and watching tv with my cat, Catface. I did not know that being a surface designer/illustrator was a job option until recently! I always liked art when I was younger, I was always the kid getting in trouble for doodling in class instead of paying attention. I thought that the only way to be an "artist" as a career was to be a fine artist, and I thought being a fine artist was limited to being able to draw or paint photo-realistically, so I reluctantly gave up on that dream. After college, while working an un-inspiring desk job, I discovered graphic design and went back to school. It was actually in my design program that I learned about the wonderful world of pattern design and fell in love. I do my graphic design job during the day and when I get home I settle in for some sketching/ideation. I try to do this every night, for a half an hour at least, just to make sure I keep my creativity flowing. When I don't have any freelance work coming in I like to give myself challenges, like posting a pattern a day to Instagram for 100 days. I find that these keep me accountable and challenge me to try new styles and techniques. I recently started working with print studio as a freelancer so most of the art i'm working on at the moment is for them. I'm also trying to open my own Etsy shop, so lately i've been working on figuring out which products are the best fit for my designs! It would be to have confidence in myself! I feel like I lost a lot of time by thinking I wasn't "good enough", and it seems very silly to me now. Big, inexpensive sketchbooks or a stack of copy paper, 6B pencils, any smooth inky pen I can get my hands on, and Adobe Illustrator/Photoshop. My design process usually begins with a concept or theme. I think about what I want to convey with my patterns and what look and feel I want to capture. Sometimes I create a moodboard if it's a big project. Then I just draw! I just draw motifs without judging, and just try to create as much as a I can within the theme. For example if i'm drawing Unicorns, I draw them in lots of different shapes and styles and then I start to draw things that could live with them in a pattern, like flowers or rainbows, etc. Once I feel like I've drawn all I can , I go through and pick the motifs I like the best and take pictures with my phone. Then I open the pictures on my ipad and trace with a sketch program so that they are vectorized. I then open them on my desktop where I can manipulate them in Illustrator or Photoshop depending on the effect I'm going for. Once I have the layout set, I start to play with color. I have an entire Pinterest board devoted to color palettes and I like to play around with options until I land on something I love. I did a really fun job for a client who makes nutrition bars for pregnant women, I really enjoyed working on the patterns for that one! 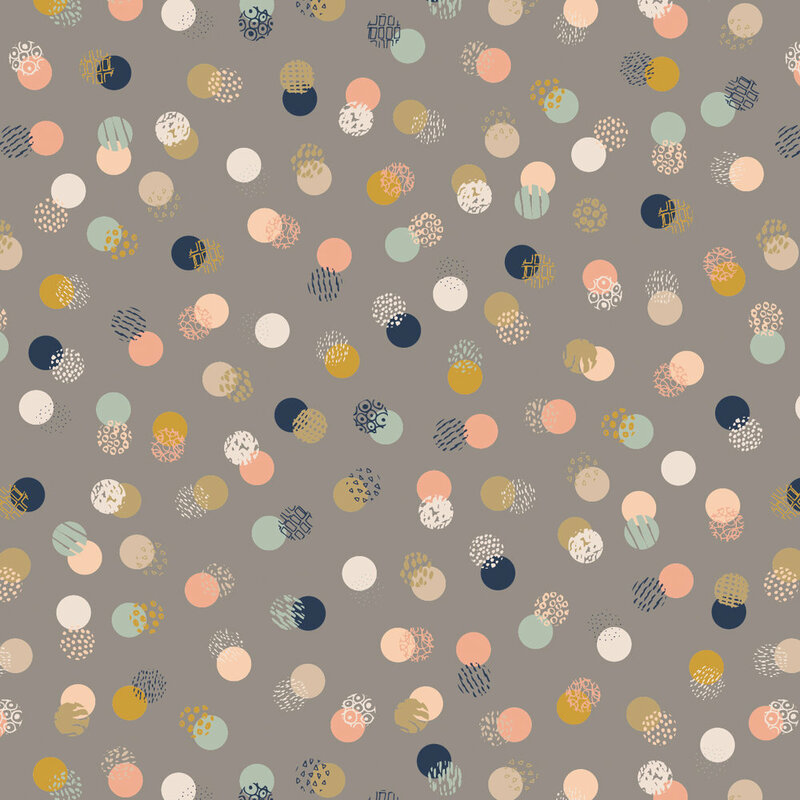 There are also a few one-off pattern's I've created that I really enjoy because I think they are fun. Lately i've been trying out a new style and I like a lot of that stuff as well even though its different from the way I normally work. I would love to design patterns that get used on products for Land of Nod!! I love their aesthetic and it would be so cool for my work to be available on such cute stuff. I would also love to do an entire home line for Target! A pencil, a sketchbook and a smoothy, inky pen. I am very inspired by things that are unusual. I love a weird flower, or an interesting rock formation, or even a very alien looking insect! Nature is the first go-to for me but I also really enjoy looking at vintage packaging, illustrations and advertisements. That's a hard question! I recently discovered the work for Josef Frank and fell completely in love! Close second are not individual designers, but I am endlessly inspired by Marimekko and Liberty of London. I hope people remember me for having a good sense of humor and being fun to be around! I strive to be a positive force in the world and hope that my work reflects that. I started my company Black Lamb Studio a couple of years ago as a creative outlet for my full time job as a luggage designer. I have a bachelor's degree in Industrial Design, but I've always been in love with graphic design, typography and illustration as well. 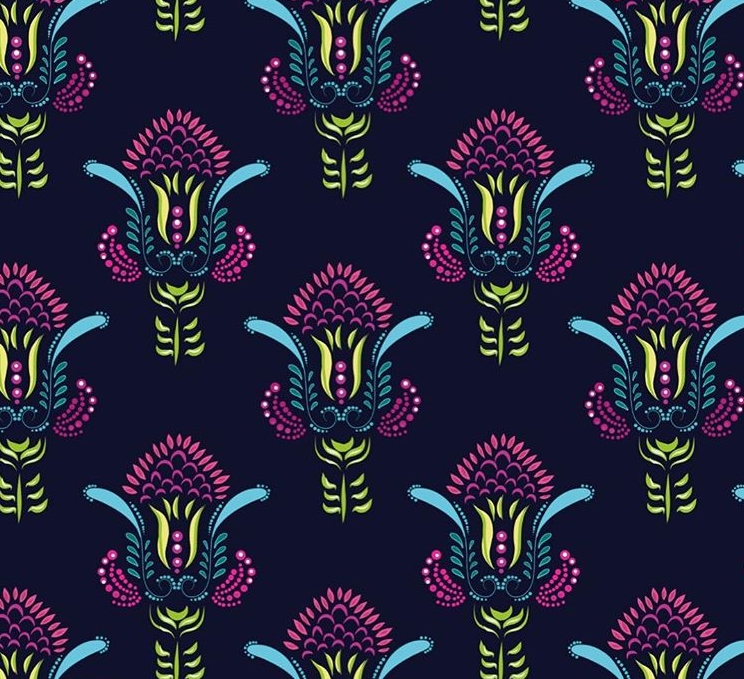 I started creating patterns for fun, because I loved it and was growing my portfolio. Soon after, I decided to contact companies that I admired and loved to introduce myself and offer my designs and got my first clients this way! I usually start my mornings slow and answer emails, make phone calls, etc. I start my design work after noon where I either paint and create new content or work on specific projects for companies I'm working with. I'm definitely a night owl and feel most productive late afternoon and nights. Don't take the "future" so seriously. Before college, I was always stressing out about making the best decision because it felt that whatever I studied would determine so much of my life. During college, I kept stressing because of the uncertainty of what my "future" and my career would look like. I graduated 7 years ago and now I understand more that life is always moving and changing, and you must be in tune with yourself, your dreams and your hopes to do what feels right and what makes you happy. If I'm feeling uninspired, I love looking at my travel pictures. Traveling is my biggest passion and looking at my pictures always inspires me and motivates me. At the moment I really enjoy gouache, Posca paint markers, and ink. Another tool that I use all the time and love is my Wacom tablet. My process always starts as a sketch. Pencil and paper. After I'm happy with my direction, or at least have a good idea of what I want I start painting. My scanner is my best friend most of the time and finally I clean up the artwork and color correct in photoshop. I also scan my sketches and trace with my Wacom tablet on illustrator when the project calls to be vectorized. Some apps that I use all the time and love: Vsco to edit pictures, instagram and Planoly to organize my posts. I also use Pinterest for a ton of inspiration (mainly color palettes), dropbox to share projects with clients quickbooks self employed to keep up with my expenses and invoices. So far my favorite project has been a collaboration with a french wrapping paper company called Impression Originale to design a wrapping paper for them. 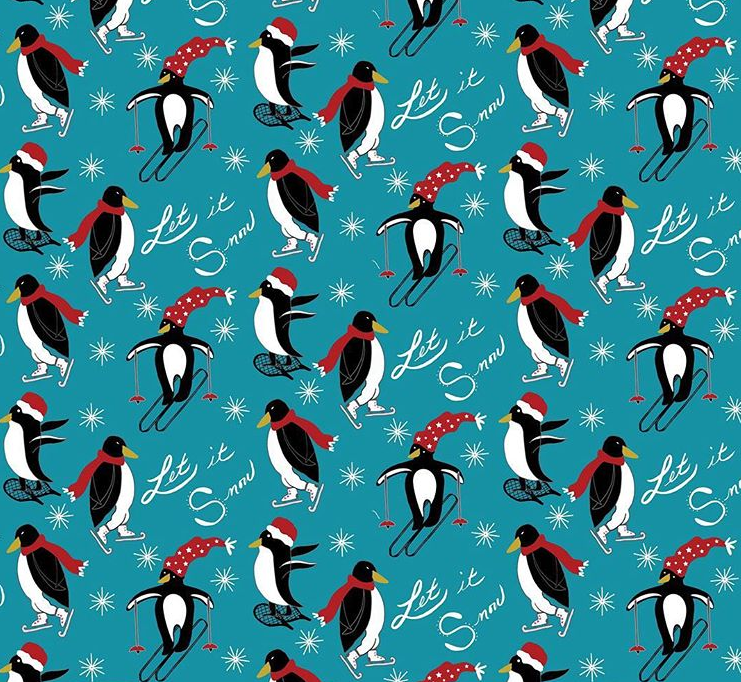 As a wrapping paper lover, this was obviously a dream! Another collab that I really love is with a company called Greetabl. They do customizable gift boxes with tons of different patterns to choose from and I'm lucky enough to be part of their super talented designer portfolio. I would love to work with Land of Nod and design and children bedding/decor collection. I absolutely love them and have been following their work for years. Definitely paper, gouache and brushes. I'm always inspired by nature, daily ordinary life and traveling. Hard question! There's a lot of designers and artists that I admire. As an industrial designer I must say I've always loved Charles and Ray Eames for their timeless design and Ettore Sottsass for his fun and colorful vision. I hope people remember me as loving, fun and creative. Oh definitely no. I’ve graduated in journalism but it was never my thing. I’ve became a pastry chef and had my own shop for about 6 years. That’s when I realized I loved anything art related, and also loved to be able to work creatively. When I closed my shop I decided to continue pursuing a career in the creativity field so I studied Fashion design. That’s when I found out about illustration and surface design in my life and at that moment I knew that’s what I wanted to do, and never looked back. I’m a morning person so I like to start working around 7 am and usually stops around 5pm. Work includes trend research, making lists of things I need to do, sketching, painting, digitizing and working in Photoshop. I take small breaks to walk my dog and eat :D Some days I have classical ballet class which I absolute love and help me stay out of the computer for a few hours. I go through this in every few weeks. There’s this lovely cartoon by Matthew Innman where he says that creativity is like breathing – when you’re creating you’re exhaling, but you can’t exhale forever. We have to stop and breath in, and that’s exactly how I feel after a big project or a few weeks of creating in a row. Now I understand it is just part of the process, and usually I spend an afternoon researching new trends, studying other artists, watching documentaries, walking outside, etc. I also like to make lists to get everything out of my head. This is equally important as the periods I’m working in the studio. Gouache paints, hot pressed watercolor paper and brushes. I guess it’s pretty standart – research, sketch, paint, digitize and finish in Photoshop. This is my most natural workflow. I try Illustrator from time to time but it’s not intuitive for me as it is Photoshop. I like Procreate with Ipad pro too, but I’m slowly adding it to my workflow. I have a few collections coming up soon that I can’t show yet, but there was also scrapbooking collections, stationery and nursery bedding that I love to see the final products. I’d love to illustrate children’s books in a near future. Brush, paint and paper... I would miss the pencil to sketch first though ! If I can pick only one person I’d choose an artist, Van Gogh for his unique style, passion and ability to paint fellings. I hope people remember me for being dedicated and making people happy through my art. Hello! I'm Heather Rosas. 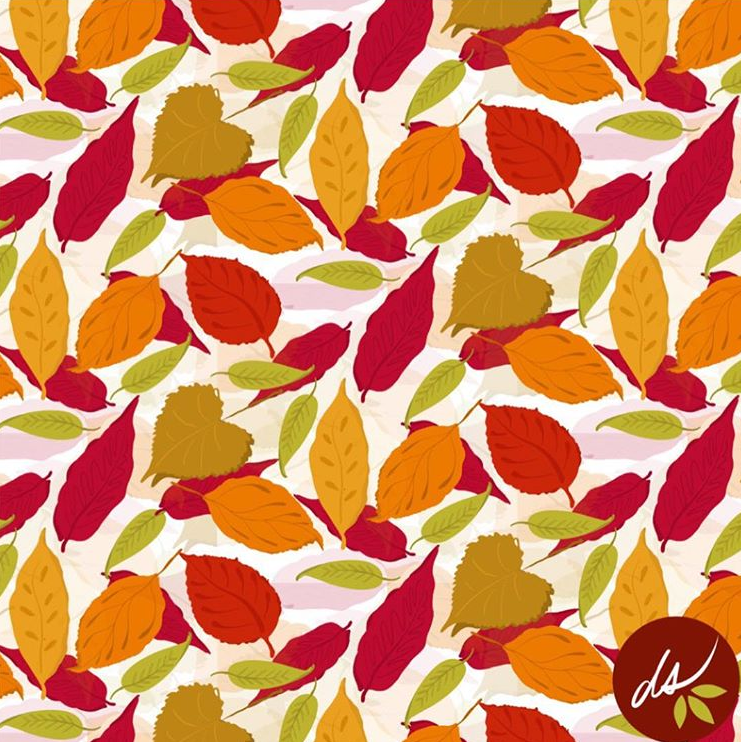 I'm a surface pattern designer and illustrator. Most of my work is for the Children's and Baby Markets, but I'd like to start expanding into other markets as well. I started out in college as an Architecture Major, but after two years I became much more interested in Graphic Design. I ended up transferring to the Massachusetts College of Art in Boston majoring in Graphic Design. I always wanted to focus on the Children's Market, and I ended up getting a job as a designer at a children's novelty publisher called Intervisual Books. After that I moved on to Mattel and worked in the creative department for Barbie Consumer Products. I learned all about licensing there, so when I decided to license my own artwork, I had bit of a background. I've been doing this for about 6 years now. I live in Southern California with my husband, two children, three guinea pigs, one dog, and one fish. So, I'm never bored! Actually, I had never heard of a pattern designer until I became one! We didn't have that major at the college I went to, so it never occurred to me. At BCP, I was on the team that would design the Barbie style guides that the licensees would use to design product with. We would work with trend experts, fashion designers, and illustrators and come up with collections that had icons, patterns, borders, illustrations and photographs of the doll. I really enjoyed that part of the job and it's pretty much what I do everyday now. After I bring my kids to school and walk my dog, I have a quick breakfast and try to dive right in to my workday. I have a much shorter day than I'd like (usually 9 to 3), because of all my responsibilities at home. I have to get used of lots of interruptions. I also do a lot of waiting in my life.... waiting at ballet lessons, basketball practices, piano lessons.... so I always have a sketchbook and pens and pencils with me. When I get a few hours to work, I have to really focus to use the time wisely. I try to have one main goal everyday. It has to be very specific, not "work on art". More like: sketch 10 icons for new collection or research inspiration, reference, and color palette today. Sometimes after I get the kids to bed and if I have the energy I might do a little work at night, but honestly, most of the time I'm wiped out! I would say, don't put so much pressure on yourself! Little by little, work on your goals, but remember to take care of yourself, too. This is a long term career and if you work a little everyday you will accomplish a lot after a few years. I would look at some of my favorite stores and artists and see what they are doing. Read some of my favorite blogs. Spend some time on Pinterest. Look at some vintage children's books. Try out a new art medium. Take an online class. Basically just play and not put pressure on myself to make something that's going to licensed right away! But to be honest, my problem more often is not having enough time to accomplish everything I want to try out. That is something I haven't solved yet! I use Illustrator the most, but I love Photoshop too and have been taking some online classes to learn more. Right now I'm trying out cut paper, and that's really fun because it takes me away from the computer (but quite messy!). I also love painting with gouache and watercolor, but I'm still learning and experimenting. If I'm starting on a new collection, I start out with research. I'll make a Pinterest board for the collection and pin reference photographs, color palettes, inspirational art from history and present time. I'll try to see what's trending right now. Maybe different ideas on how to add texture. Even products that I might imagine the collection being used for. This gives me a place to start. Then I will spend a couple of days just on sketching. Sketching from reference, sketching from imagination, experimenting. Maybe sketching with cut paper or black ink or gouache. The next step is usually inking the best sketches, scanning them, and turning them to vectors in Illustrator with live trace. Then lots of time experimenting with color. Next I'll put some pattern repeats together and make some digital mock-ups with Photoshop. I've found that putting the extra time to put together a mock-up really pays off, rather than just showing a pattern. 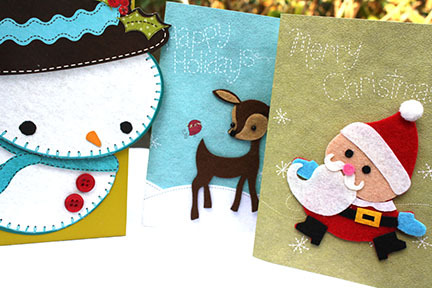 I usually just purchase the mock-ups from Creative Market or Design Cuts, because my time is so limited. I have a couple projects that stand out for me. I did a Holiday Collection with CR Gibson a few years ago. 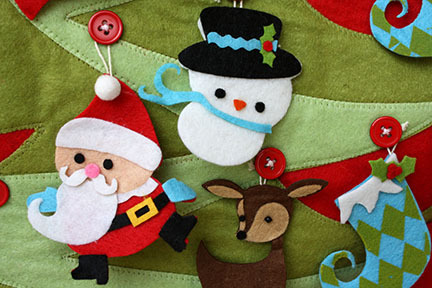 It was all produced with felt and hand-stitching. We still put the Christmas ornaments on our Christmas tree and hang up the Advent Calendar every year! I was lucky enough to do a nursery decor collection. There was wall art, banks, nightlights, bibs, blankets, and picture frames. It was a woodland animal collection. My daughter still has the fox and owl bank on her shelf in her room. 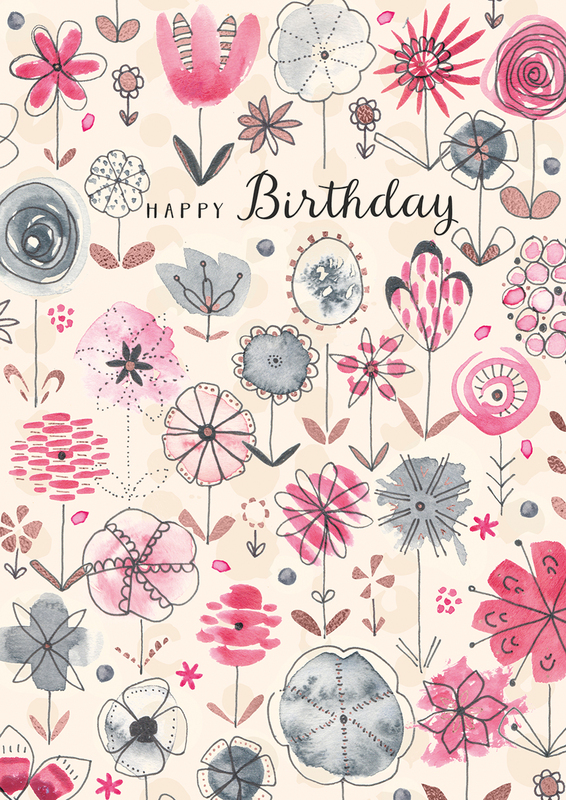 I also did a greeting card with Design House Greetings. It was sold at Trader Joe's and I think between my Mom and my Aunt, every one of those cards in the Santa Barbara area Trader Joe's was bought by one of them! I would LOVE to do a bedding collection with Land of Nod! Oh no! That would be terrible! I would say: pencil, sketchbook, Illustrator. Pinterest, Instagram, nature, vintage children's books, art history. I love Charley Harper. So ahead of his time. His art looks current and modern and relevant and yet is 60 years old! Amazing! I hope people remember me as a great wife and Mommy. I love making art and I think it's important for everyone to have their own passion, but my husband and children always come first.